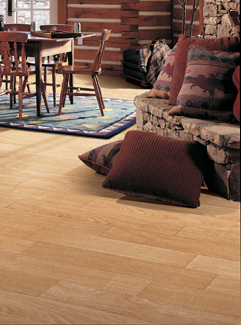 Introduce a new level of character and texture into your home with our wood look tile in Lubbock, TX. When you take advantage of the latest innovations in manufacturing and imaging, you can introduce the attractive look of natural hardwood to rooms with higher levels of moisture. The selection of tile options at Leftwich Chapman Flooring America includes a new generation of products from many of the major manufacturers you have come to trust. The charm of hardwood flooring is challenging to replicate in places like your kitchen and laundry room. Traditional solid hardwood expands and contracts when exposed to moisture, so many designers avoid using wood at all in bathrooms on the upper floors. When you visit our flooring store, start a discussion with one of our design professionals, and tell them more about your priorities. Our selection includes porcelain and ceramic tile with a top layer designed to replicate the appearance of natural hardwood. Each is produced by the firing of specialized clays, and they are imprinted with unique patterns that mimic the grains of different species. Our team is ready to identify the right type of tile product for your design plan and your overall approach to style. When it comes to the kitchens and bathrooms in area homes, tile has been a mainstay for years. In the hands of the right contractor, ceramic can be cut into original shapes that fit the specific spaces and places in your home. As a denser variety of tile, porcelain makes a better choice for covering walls and outdoor spaces. Our wood plank porcelain tile gives your interior the traditional look of wood with the enduring resilience of tile. Protect the walls of your bathroom with tile that matches the character and appeal of wood. Shield the interior of your home from the added moisture you can expect in a kitchen. In the hands of a creative installation specialist, our wood plank ceramic tile can cover more of your floor than you ever thought possible. Transform your home into a place that others want to purchase, and lay the groundwork for generations of family enjoyment. When you choose one group that offers a proven line of ceramic wood tile products and porcelain tile installation by professionals, you get an interior that is capable of enduring whatever life has to offer. Contact us today to see how our wood look tile performs in rooms with added moisture. We proudly serve customers in Lubbock, Levelland, Plainview, Seagraves, Littlefield, Texas, and surrounding communities.